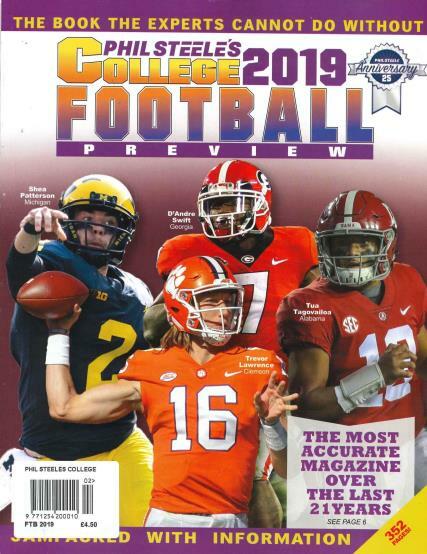 Phil Steele's College Football review for 2018 is a colourful magazine jam packed with all you need to know on the college football season. Phil created the first edition of this magazine in 1995 and its has now progressed from a black and white edition with just 192 pages to the colourful 352 page edition we see now. Phil writes every single preview himself and his passion shows through. A double page is dedicated to each team, with forecasts, statistics, and projected starting line ups. We discover the pre-season top 40 teams, the most improved teams, which teams play the toughest schedules and which is the toughest conference. This most informative magazine has won the title of the most accurate magazine over the last 23 years. Excellent. Great depth of coverage.